We believe that giving back to our community makes us stronger! 3 Kittens is committed to doing more than just handing you a gift certificate for your silent auction. To truly make an impact on your cause, we believe it takes a partnership. Through working together, we can make a larger impact, strengthen our communities, and build many rewarding relationships along the way. Schools, churches, non-profits, senior living facilities, and more are all welcome to apply. Featured Item Fundraiser: For an entire weekend, 3 Kittens will donate 20% of all sales from a designated item! Invite your supporters to purchase the item - and enjoy the added purchases of that item by our weekend customers who are already visiting 3 Kittens. Shopping Party Fundraiser: Bring your supporters in for an evening of socializing fun! Host a shopping party at our store for two hours on your chosen day, and 3 Kittens will donate 15% off all sales to your fundraising efforts. Complimentary beverages and party favors included. 3K Bucks: Receive $10 gift certificates for up to 50 guests attending your fundraising event! Give them away or sell them to raise even more money for your organization. 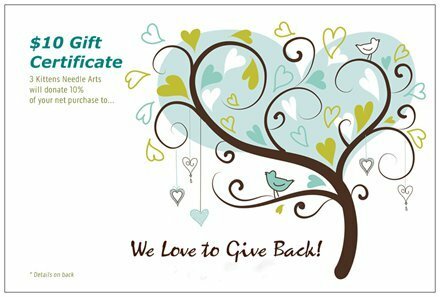 When the gift certificates are redeemed, 3 Kittens will donate 10% of net purchases (total purchase less the $10 gift certificate) back to your organization! Organization Information - name, organization type (e.g., school, church, etc. ), street address (including city, state, zip), phone, email, website (if any), contact person's name/email, and tax exempt status. A brief description of the organization and how you are involved with it. For 3K Bucks, please tell us about the event at which you will be giving or selling our 3K Bucks certificates and indicate the number of certificates you would like to receive (up to 50). Any additional information you would like to share about the event or the organization and how the funds raised will be used. Preference will be given to organizations that are tax-exempt. 3 Kittens reserves the right to limit the number of organizations we support each year. Your application does not guarantee our partnership with you. We will notify you as soon as possible if we can help your organization.